The Philadelphia Museum of Art Craft Show will be held at the Pennsylvania Convention Center, 1101 Arch St, Philadelphia, PA, Nov 11-15, 2009. Participating basket artists include Christine L. Adcock, Mary A. Jackson, Ed Bing Lee, Kari G. Lonning, Debora M. Muhl, Joh Ricci, JoAnne Russo, Biba Schutz, Aaron Yakim & Cynthia W. Taylor, Samuel Yao and Jennifer Heller Zurick. 12:00 PM Cynthia Taylor and Aaron Yakim, Parkersburg, WV, booth #505: How to transform a young straight white oak tree trunk into a basket. 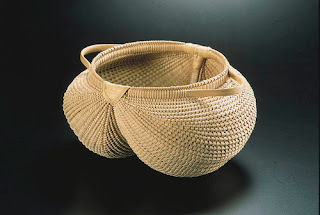 2:00 PM Kari Lonning, Ridgefield, CT, booth # 710: Basket Making - How to weave a 'hairy' basket. 3:00 PM Sung-nim Joun, Korea, booth #412: See how the artist makes a headpad with traditional Korean rush twisting and coiling techniques. At this year's Philadelphia Museum of Art Craft Show, 195 craft artists from all across the U.S. are exhibiting and selling their work, selected by a jury from over 1300 applicants. In addition, a group of 26 guest artists from Korea will also be featured. The Craft Show will be held from Thursday, November 12 through Sunday, November 15 at the Pennsylvania Convention Center, with a VIP Preview and reception on Wednesday evening, November 11. For tickets and information please see www.pmacraftshow.org or call (215) 684-7930. That is one of the most exquisit buttocks baskets I've ever seen. I basket weave as a "craft". What you've pictured is really an art.